Late on a Tuesday night at Phoenix’s Sky Harbor Airport, an employee was taking trash to a Dumpster outside the air-traffic-control tower when a mysterious glow caught his attention. A massive V-shaped object was hovering off the ground, light emanating from the bottom. “The lights were what I noticed at first … It was very large as it passed beside me,” the witness stated. “I was in total disbelief that it was happening. 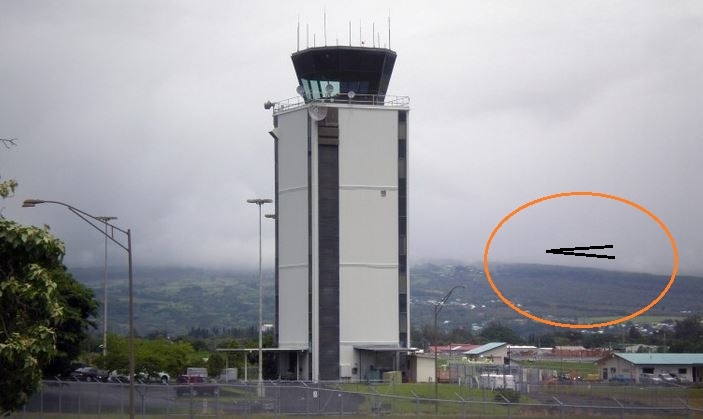 It made no noise at all.” The reported sighting occurred about 9 p.m. on March 1 at Terminal 4, but was just recently investigated and reported by the Mutual UFO Network witness report database. An article on the case first appeared on a UFO website. The airport employee described the object’s movement as it traveled over to the Sky Train Station, when he lost sight of the lights. Although he believed that it was otherworldly, he said he was not afraid. “I didn’t feel anything but shock as I pondered what had just taken place,” he reported, along with an illustration of what he saw. “This event lasted just about five minutes or so. I felt calm and no sense of danger or apprehension afterwards. Just a sense of wonder and amazement that something so huge could travel in the air and not make any noise.” The airport sighting is just one of hundreds of reports of UFOs in Arizona, making the state one of the top places on the planet for purported alien activity, according to reports compiled by the Mutual UFO Network. NOTE: The above image is CGI.